Busy moms know that a trip to the grocery store can seem daunting, especially with your child in tow. Thankfully, many moms before of us have mastered the art of visiting the grocery store and making it out with the items their family needs. So how can you make your trip to the store simpler? It seems like an obvious thing to do: make a list before you visit the store! 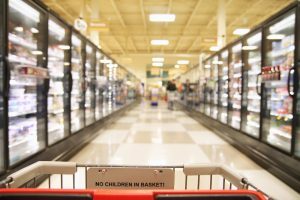 Too often we don’t prepare for our trip to the store and ultimately end up wandering the aisles, aimlessly piling our carts with items our families may not ever eat! By making a bulleted list, not only can you cut down on the time you spend in the store, you can cut down on the cost as well. Not all stores are as family friendly as we would like. By doing your research ahead of time, you can find a local store that is equipped with carts that make shopping with your infant simpler and safer than ever. Stores that carry the Safe-Dock have shown that they are committed to making your shopping experience as safe and as seamless as possible. Can’t find a store in your area? You can request it at your favorite grocer! As a busy mom, it’s hard to imagine finding a free moment to head to the grocery store. By strategically selecting the day of the week and the time you hit the store, you can avoid a lot of crowds and hassle! Ask your local manager if there are peak times they would recommend avoiding. While it may seem inconvenient to shop during certain hours, the amount of time you save by shopping in a much less crowded store will be well worth it. The next time you visit the store, take these extra steps to make the experience much more simple and enjoyable. A visit to the grocery store can be fun, when you’re prepared!